Picture this scene. It's an abandoned city, the streets deserted and cars left, doors still hanging open. It's the disaster movie equivalent of a tumbleweed blowing across the screen. Our wary hero ventures into the scene. Suddenly she is running. Then slowly coming into focus we see what she is running from... a horde of zombies. "If only we hadn't all taken so many antibiotics for bladder infections, we would have had a cure for this dreaded zombie disease but alas all bacteria are now antibiotic resistant". Then the zombies finish her off. It's quite a touching scene and you'll probably shed a tear or two. Ok. So maybe writing a movie script isn't really my forte, but this is an example of what could happen if we continue to use and abuse antibiotics. Albeit an entirely unlikely and far fetched example. But zombie apocalypses aside, there is a very real danger coming from antibiotic resistance. 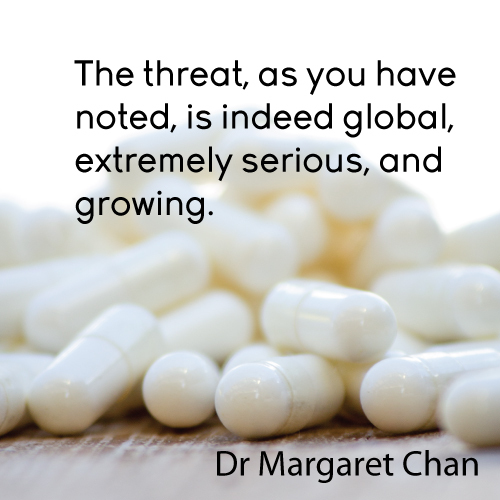 Last year Dr Margaret Chan, the director general of the world health organisation spoke about the dangers of antibiotic resistance. She spoke of the world wide significance of the issue and just how serious it is. In the days before antibiotics were discovered, people could die from something as simple as a scratch. If we continue to abuse and misuse antibiotics, those days could return. So what is antibiotic resistance? Antibiotics work to make you feel better by killing the bacteria which are causing the infection in your body. But often not all the bacteria are killed. The few that survive the antibiotics will now be immune to antibiotics. These bacteria have evolved and are now stronger. Stronger antibiotics are developed to combat them. Again the bacteria evolve and … you can see how this becomes a vicious cycle. Bacteria are becoming resistant to not just one type of antibiotics, but lots of them. 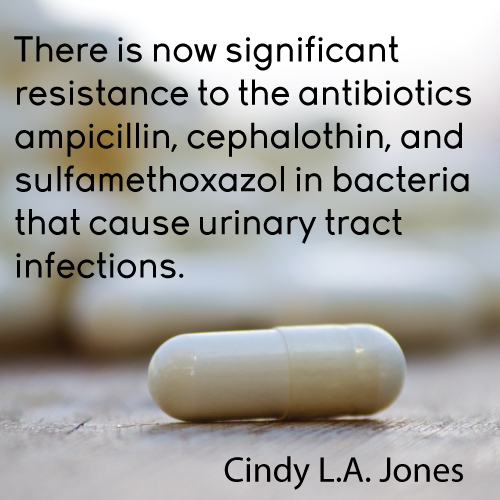 There comes a point where stronger antibiotics just cannot be used. Which leaves us with no antibiotics to use for common problems like bladder infections but also no antibiotics to use for potentially life threatening illnesses either. For a long time now, I have chosen to no longer use bladder infection antibiotics for myself. They can upset the delicate balance of our systems and for something like a bladder infection I don't think the risk outweighs the benefits, especially when there are so many other options with little or no side effects. But that's not to say I will never take antibiotics again. If there is something life threatening, I want the drugs! In that case the risks definitely outweigh the side effects. But if this antibiotic resistance continues as it is, there will be no antibiotic option available, whether the bacteria I am battling is simply painful or life threatening. While you may think, you don't take bladder infection antibiotics, this doesn't apply to me... well think again. Antibiotic resistance affects us all, this is a global problem. The bacteria that has evolved to be resistant to antibiotics does not just stay with people who have taken lots of antibiotics but gets shared around amongst us all. These stronger bacteria spread across the world leaving everybody susceptible. Those most susceptible are those who are already sick... those in hospitals and nursing homes. Not only are their immune systems already compromised, they are also in one of the places where the most resistant bacteria are likely to live. So is a zombie apocalypse the only possibility? There are steps we can take to change this outcome. No not just zombies but having full antibiotic resistance. If how antibiotics are used is changed, we have a chance to turn this around now. 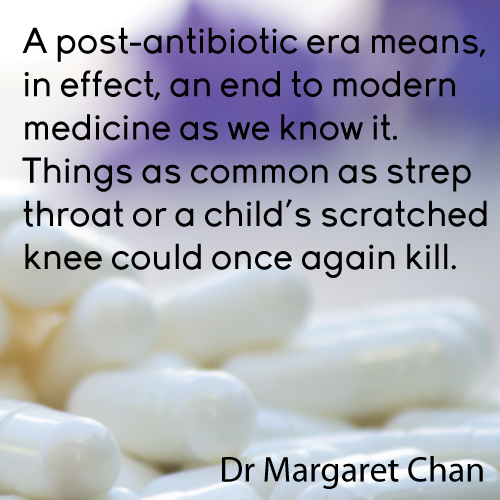 If we can change it, we have the chance to keep antibiotics for the times when we really need them.